If you’re a fan of Tattered Angel’s Glimmer Mist, there’s going to be even more for you to love from the company’s CHA Summer release. The color family has expanded to include Glimmer Glam, Glimmer Chalkboard and Glimmer Glaze. Each offers a different level of opacity from nearly transparent to opaque. Here’s Tattered Angel’s Liz Hicks showing off the new product. And here she is demonstrating the differences between the four members of the family. The Mist is the most transparent, followed by the Glam, then Glaze and the most opaque is Chalkboard. 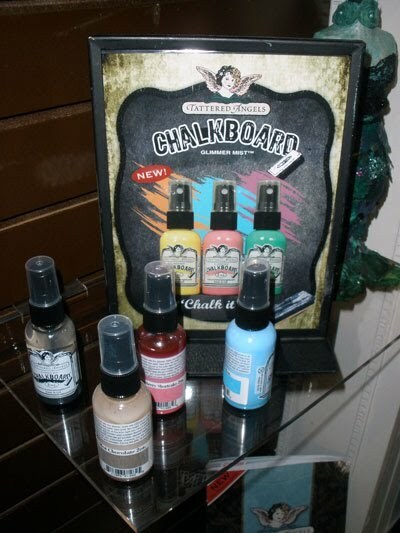 You brush on the Glam and the Glaze, and the Chalkboard is in a spray bottle. The Glam and Glaze are permanent, available in 24 colors and they resist (how cool is that?). Here’s the Glam, which has a glimmery sparkle and contains custom glitter. Hicks said it’s very similar to the Mist, and the glitter won’t come off. Next up is the Glaze, which comes with a nail polish-like brush applicator. This water-soluble paint is more concentrated and more opaque with lots of glittery shine. If you apply a light coat, it dries immediately. No kidding. It also has a high gloss finish. And here’s the Chalkboard paint, which also dries very quickly. It gives you the look of chalk without having to mess around with the chalk itself, or worry about it rubbing off. It’s also water-based, and has a paint additive to make it more opaque. Tattered Angels also released several new goodies to use these colorants on. 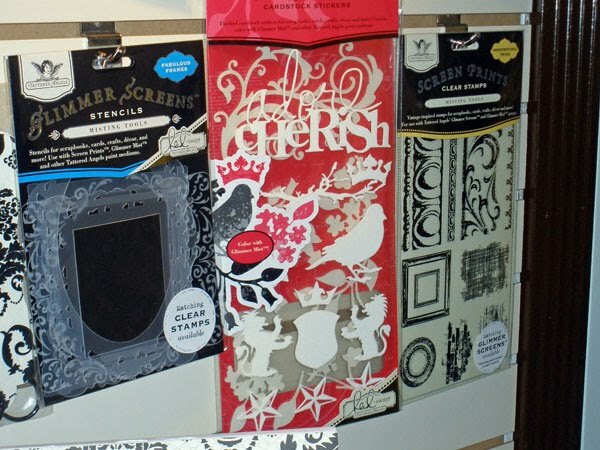 They have lots new glimmer screens, prints, stamps and these very cool crepe papers. Hicks said the clear stamps are on a heavier plastic backing which can be used for stamping. No clear blocks needed! 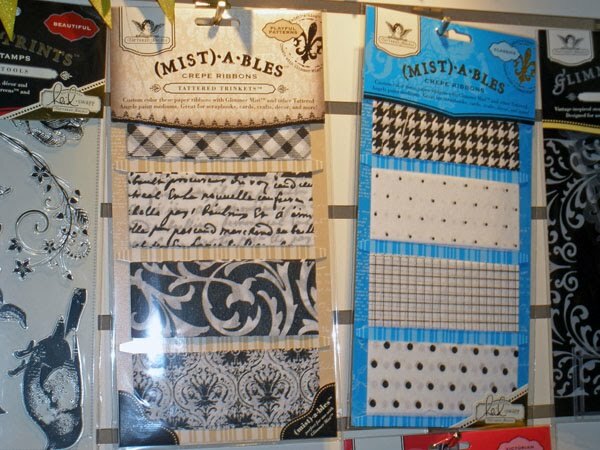 In the middle of this photo are white flocked mist-a-ble stickers by Heidi Swap. Other Heidi Swap exclusives are available including screens, prints and resist titles. Here’s some flocked paper, which can also be misted or painted, and 7×9 flocked album that has been decorated with the Glimmer family of color. 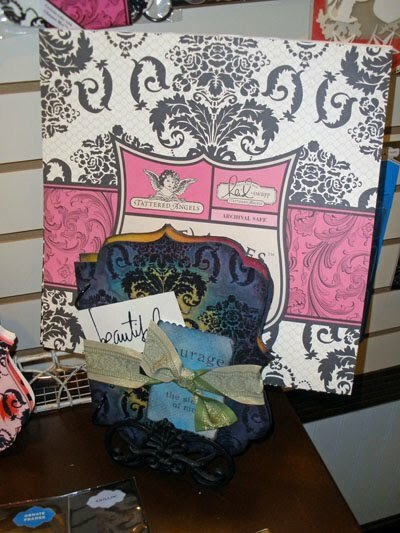 What do you think about these new products from Tattered Angels?